When we left our intrepid explorers everyone was in a boat in the midst of a mangrove estuary in the Cuero y Salado Wildlife Refuge and monkeys had been sighted and photographed…but there was still so much more to see! One of the next marvelous sights was a bird that I had seen for the first time several days earlier in a radically different ecosystem in a lake in the rainforest in the middle of the country. I guess Sungrebes (Heliornis fulica) are more adaptable than I thought! It’s just too bad that the movement of the boat coupled with the movement of the bird combined with the bird’s tendency to stay as close to the shaded banks as possible caused lousy pictures. Or it just might have been my incompetence. Either way, here is a seriously ugly picture of a Sungrebe, a pity because the Sungrebe, the only species in its genus and one of only three in the Heliornithidae family, are exceedingly interesting and are worthy of better photographic treatment. Maybe next time. I scarcely had time to be disappointed in my photo taking skill or to appreciate the great views we had just experienced of the Sungrebe when we were on to our next exciting sighting, that of a perched Blue Morpho butterfly, in this case a Morpho peleides, or Peleides Blue Morpho (Blue Morpho is actually a generic term that describes several species). I didn’t really understand how uncommon it is to see a morpho sitting with its wings open until I took a moment to look at the faces of folks on the boat who know butterflies well. They looked like I imagine I looked like when I saw my first monkeys. In other words, seeing a morpho like this was A Big Deal. 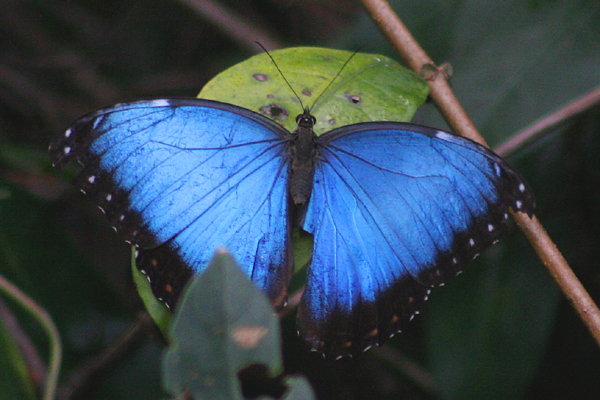 I will say that, as far as butterflies go, Peleides Blue Morphos ain’t too shabby. But you can decide that for yourself because even I managed to get decent shots of a stationary butterfly. In Wild America James Fisher wrote that “It was no bird or exotic mammal that made me realize one of my boyhood dreams of the dark tropical forests of the Americas…It was a six-inch butterfly, flapping slowly through the dark wood path, a butterfly of the bluest, purplest metallic sheen when caught in a rare sun ray, of the deepest black in the shadows”. He was, of course, referring to a morpho, and while it was seeing monkeys in the wild that let me fulfill a long-time tropical dream I can see how one could be enchanted by and dream of seeing such a beautiful butterfly. 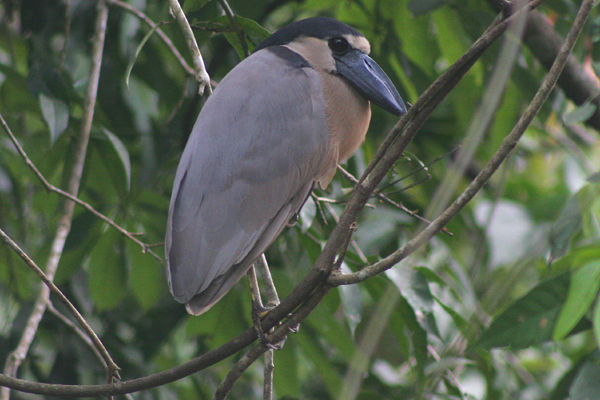 Once everyone had their fill of the morpho (and this took some time) we moved deeper into the mangroves, seeing an occasional Yellow-crowned Night-Heron or Ringed Kingfisher along the way. The sun continued to beat down on us and, for the first time on the entire trip, I had to put a second application of sunscreen on as a precaution (I wasn’t going to suffer through sunburn if I could avoid it). Once again, I marveled at the beauty of the mangrove ecosystem and wished that I lived closer to mangroves so I could enjoy them more frequently than, you know, once ever. Further and further into the mangroves we went and the anticipation of seeing Boat-billed and Agami Herons kept increasing. 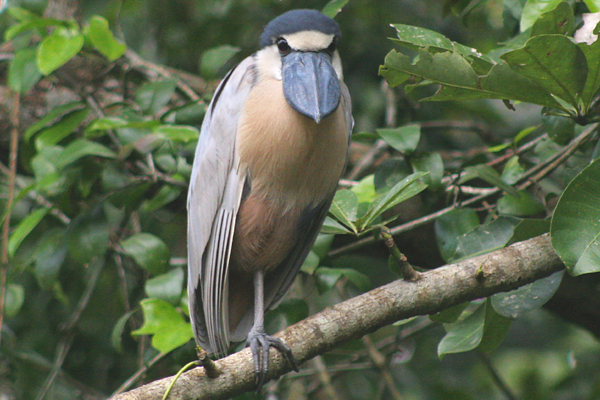 Finally, we came to the Boat-billed Heron spot, where later in the year they would be nesting but as of the beginning of March they were just hanging around being herons. Other than their extraordinary wide bills Boat-billed Herons (Cochlearius cochlearius) aren’t spectacular to look at, though we did see some cool courtship behavior (I’ll have a gallery of Boat-billed Herons up soon). A life bird is a life bird though. After our agami encounter we were ready to head back to the boat launch and the train and head back to the hotel for lunch, but we still had several birds, as it turns out, to see on the way back. A Great Black Hawk flew past overhead which, like the Gray-headed Kite we had seen earlier, was a lifer for me, and we also spotted my first-ever Anhinga (I really need to get to the southeastern United States). We also spotted out first Bare-throated Tiger-Heron of our mangrove expedition, and that made ten herons and egrets for the day (not even counting Wood Stork). And, in addition to the Ringed Kingfisher mentioned above we also managed to spot Belted, Amazon, and American Pygmy Kingfisher, leaving only Green Kingfisher on the table. 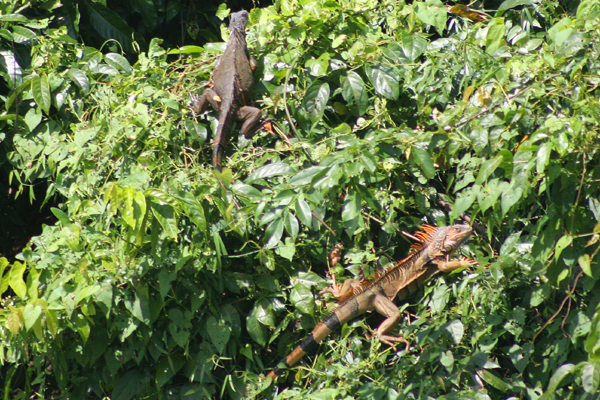 Our last really cool sight for the mangrove trip was a pair of Green Iguanas (Iguana iguana) sunning in a bush that allowed for rather close approach. They were awesome and let us get great looks until they suddenly vanised into the bushes all at once. It was a great trip into the mangroves and I highly recommend the Cuero y Salado Wildlife Refuge to anyone who likes nature at all. Even if you miss some of the things you hope to see there are a ton of interesting creatures living in the refuge and the mangroves themselves are a sight worth seeing on their own. If you are interested, below is the list of species seen on our morning-long expedition on March 3, 2009. Those are some incredible birds. Plus your morpho shot is intense. I chased blue morphos in Guatemala with nearly the same intensity I sought quetzals. What a cool, underbirded place. 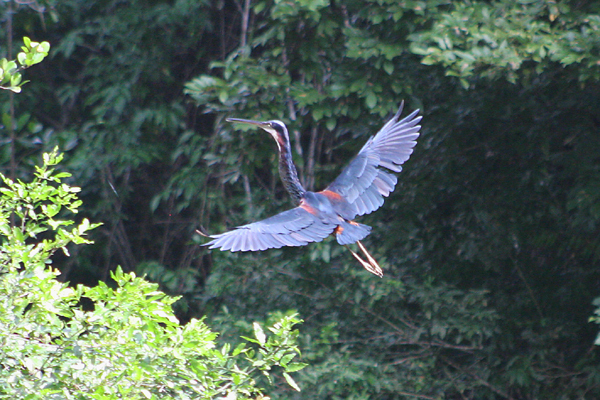 That is the only image I have ever seen of Agami Heron in flight! I’ve got to get up to Honduras sometime. Where Are You Birding this Second Weekend of May 2009?